As well as offering a glimpse into the craft of traditional wine making, Kent is home to golden blue-flag beaches, stunning castles, exciting culture and delicious food. England is one of the most dynamic and fast growing wine regions in the world, with Kent boasting the most favourable climate for viticulture in the country. Kent’s charming vineyards are set in some of the most picturesque corners of England, and visitors can spend time sampling award-winning wines and indulging in delicious home-grown seasonal produce. The Wine Garden of England ranges from England’s leading wine producers to the first Champagne House to plant a vineyard on English soil. Visitors will discover the secrets behind crafting wine using the ‘méthode traditionelle,’ when they meet our craftspeople responsible for creating exquisite English still and sparkling wines. After exploring the sun-kissed vineyards, visitors can enjoy tutored wine tastings of critically-acclaimed English wines from the comfort of our many elegant tasting rooms, each with their own unique character. If arriving by air, London Gatwick and Heathrow offer worldwide connections into England, and both airports have road and rail connections into Kent. Rail travel to and around Kent is operated by Southeastern. London Bridge, Charing Cross, London Waterloo East, Victoria and St Pancras International stations all connect to Kent destinations, with St Pancras International operating the High Speed service, taking less than 40 minutes from London. Eurostar services from Europe also stop at Ashford and Ebbsfleet International stations. If travelling by car the best way into the county from the UK is to head to London and the M25. Once on the M25, pick up either the M20 or M2 motorways that run through the centre of the county. 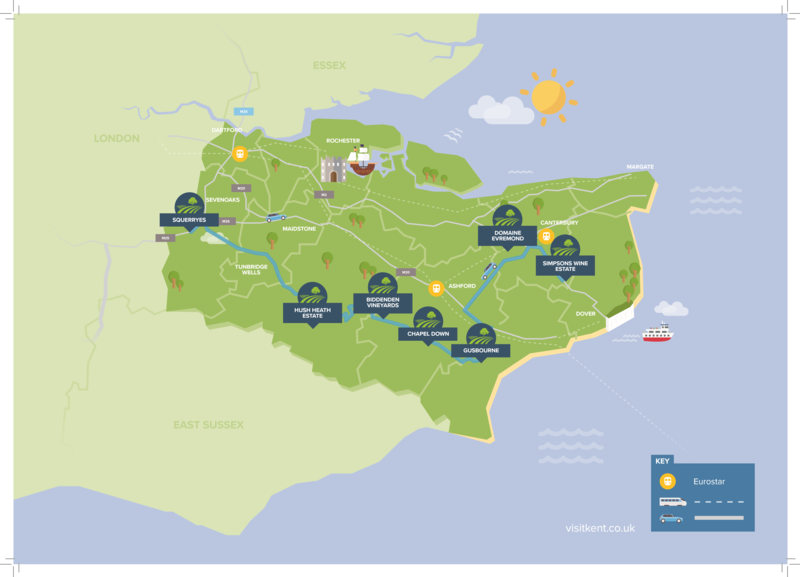 Kent is also accessible by sea via P&O ferries and DFDS Seaways who both operate 90 minute services from Calais to the Port of Dover. Plan a day trip with a difference sampling award-winning wines and indulging in fantastic seasonal produce with English Wine Tasting and Tours. English Wine Tours will take you to two outstanding vineyards in Kent. The day will begin with a morning stroll through the vine covered fields of Chapel Down winery. You’ll learn about the art of winemaking and be able to sample their multi-award winning still and sparkling wines in a guided tasting. Lunch will follow at either The Goudhurst Inn or The Ship Inn, both serving traditional English dishes using fresh local ingredients. After an exquisite meal, you’ll be whisked away to The Hush Heath Estate to sample their outstanding range of wines. Luxury travel to and from London will be provided to make for a stress free day and included in the price. Wine Tours depart every Thursday and Saturday from central London (English Grounds, Near London Bridge) and tickets can be purchased direct from www.EnglishWineTastingTours.co.uk . Discount for groups of 6 +. Profile We offer wine tours to English Vineyards. We have weekly open tours (sold by the seat) departing from central London every Saturday from May through to November. These include transport, our expert (and entertaining) tour guide, tour & tasting at two vineyards and pub lunch all for just £97pp. FIT or Groups: We can cater to FIT or Groups, price per person based on the group size. Extra information: English Wine Tasting Tours offer 3 main products. Please do get in touch to find out more, or to discuss bespoke tours. 1) Open Tours which run every Saturday from May through to November and depart from Central London. These are sold on a seat basis and cost £97 per person. They visit two vineyards for a tour and tasting and include lunch and English Wine Expert tour guide for the day. 2) For groups of 8 or less we offer an executive mini-bus service, with expert tour guide, visiting 3 vineyards and lunch. This is a flat fee of £580. 3) For groups of 9 or more we offer private tours. These are priced per/person depending on the group size. Established in 1969, Biddenden Vineyards is Kent’s original vineyard, owned by the Barnes family and has remained family run ever since. Eleven different varieties of grapes are grown onsite with all vine work and picking done by hand to ensure the very best quality. Visitors are welcome all year round to experience the splendid wine tours and can sample Biddenden’s signature wine, Ortega, which is a double winner of English wine of the Year. Profile Kent’s original vineyard, Biddenden was established by the Barnes family in 1969, celebrating its 50th anniversary in 2019. Producing award-winning still and sparkling English wines, ciders and apple & pear juices, visitors are welcome at the vineyard year-round. Open tours run Saturdays April-September with private tours by prior arrangement. Set amongst 22 acres of vineyards, recognised as an ‘Area of Outstanding Natural Beauty,’ Chapel Down winery offers a world class range of sparkling and still wines, and is England’s leading wine producer. Chapel Down winery has excellent visitor facilities including a two AA Rosette and Michelin Bib Gourmand restaurant and a shop stocking wines, spirits, beer and a variety of local produce. The vineyard tours run from May – September with wine tasting classed throughout the year. Profile Home to England’s leading winemaker The Chapel Down winery has excellent facilities for visitors including a two AA Rosette and Michelin Bib Gourmand restaurant and a shop stocking wines, spirits, beer and a variety of local produce. Chapel Down offers guided tours and gift experiences. Visitors are also welcome to explore the grounds, the beautiful herb garden and vineyard walks. Frequency: Tours are available throughout the year. Frequency varies. Extra information: Evening group tours are available by prior arrangement, and joint itineraries with other local attractions are available. Launched in 2015, Domaine Evremond marked wine history as Champagne Taittinger and UK partners, Hatch Mansfield, bought 69 hectares of land with the intention of planting a vineyard – the first Champagne house to do so. Domaine Evremond want to share their story as it unfolds, with the first fruits appearing in 2019 to make their first bottles. A long patient wait will follow until we can sample their first sparkling wines in 2023. Gusbourne Estate dates back to 1410 and in 2004 was taken over with the intention to create wines that would compete with the very finest offerings across the globe. Since the first release in 2010, their trio of English sparkling wines have received critical acclaim in major UK and international competitions. Profile Our tasting room, the Nest, in Appledore, Kent, is open to visitors all year. We offer a variety of tours that give an insight into just what it takes to make world-class English Sparkling Wine. Tours take in our beautiful vineyards, behind the scenes in our winery, and end with a luxurious tutored wine tasting. Min - Max capacity: No minimum, maximum group size is 20 per tour. Private tours: Yes private tours available. With family values at its core, Hush Heath Estate has a distinct ‘house style,’ producing wines of great elegance and purity. The vineyards are located on a 400-acre Tudor Estate in the heart of the ‘Wine Garden of England,’ with ancient oak woodlands, vineyards, apple orchards and wildflower meadows ready to explore. Visitors are welcome to taste Hush Heath’s nationally and internationally award-winning wines in the new tasting room that overlooks the vineyards. Profile Hidden deep in the Garden of England, the Estate is home to our award winning English sparkling wine, Balfour Brut Rosé. Since its beginnings the Estate has grown its product range substantially and now boasts an exquisite selection of wines and ciders. Min - Max capacity: No Min, Max 50. The Simpsons have been making award-winning wines at their Southern French property since 2002. They have brought their wine expertise to Kent, enticed by the quality of the terroir and the opportunity to become part of the most dynamic wine region in the world. Simpsons Wine Estate offers vineyard and winery tours and tastings, which are held in the elegant Glasshouse Tasting Room with the world’s first winery helter-skelter slide. Profile Charles & Ruth Simpson have been making award-winning wines at Domaine Sainte Rose, their stunning, southern French property, for the past 17 years. In 2014 they brought their expertise and savoir-faire back to the UK establishing Simpsons Wine Estate in Barham, Kent, with an aspiration to create the finest quality traditional English sparkling and still wines. Frequency: Bi-monthly vineyard tour & tastings from June - September, self-guided tours every Friday afternoon from June-August. Translation: English, French and Italian. Squerryes winery is nestled at the foot of the North Downs and only use fruit grown onsite to produce their award-winning vintage. Respecting the ‘traditional method’ of making wine, Squerryes take a minimum of four years to make their Brut and Rosé wine from their hand-picked harvest. Visitors can enjoy a number of food and Squerryes-led experiences in the spring and summer months, as well as a number of premium private tours of the vineyard and winery. Profile We are a small, boutique wine brand part of a 300 year old, 2,500 acre English estate in an Area of Outstanding Natural Beauty on the North Downs. We operate a guided tour of our private vineyard together with a tutored tasting of three of our vintage wines, along with a talk on the future of English wine. Min - Max capacity: up to 24 (for tours) 30 to 200 (for events). Frequency: Public tours once a month on a Friday and Saturday.